Shimul Melwani studies the "dark side" of emotions in the workplace. Here, she talks with her graduate student, Angelica Leigh, who focuses on diversity in organizations such as the influence of racial and gender stereotypes on negotiation outcomes. Two days before the 2016 election, Shimul Melwani sat in her office with graduate student Angelica Leigh, discussing the two paths diverging before the nation’s voters. As they oscillated between the outcomes of route A and route B, they realized that people in offices across the country, during breaks for coffee or in between meetings, were doing the same thing. They hypothesized how the reactions to something as pivotal — and contentious — as a presidential election would follow employees into the workplace, for possibly months to come. They turned their curiosity into a new research study to find out how the election’s impact on workplace motivation contrasted between people of different political identities. Melwani and Leigh sent out surveys to full-time employees identifying as either democrat or republican to follow their change in motivation in their work over time. They found that while democrats underwent a post-election dip that extended six months to the following May, republicans felt a brief uptick in the following weeks that eventually leveled back out to normal. This study is one of Melwani’s many examining the workplace. 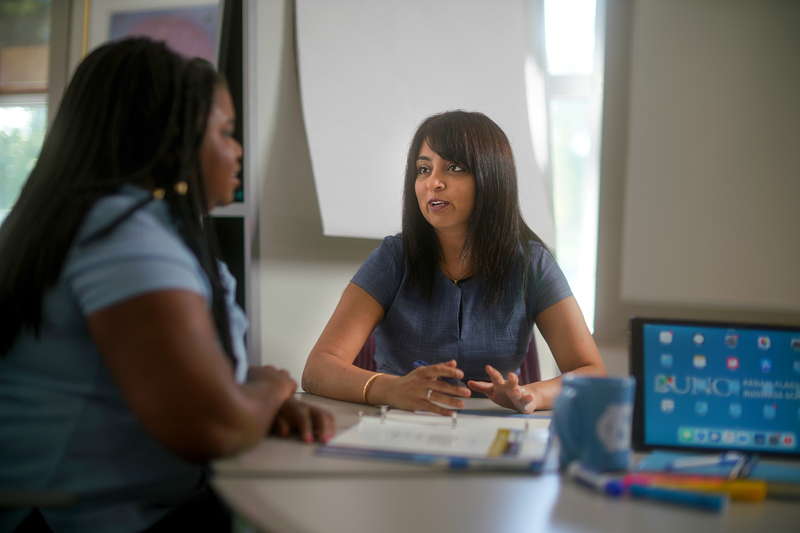 As an assistant professor in the Kenan-Flagler Business School, she researches the interactions of individuals and groups in organizations, or organizational behavior. Melwani’s work delves into what companies often discourage employees from bringing to work: negative emotions and other phenomena she calls the “dark side” of her discipline. The results from her studies, featuring the impact of stressful personal events like office frenemies to outside “mega-events” like the 2016 election, provoke thought on what it means to be professional and the flaws of some company cultures — something businesses aren’t always apt to change. While her work challenges offices to make space for complex human emotions, she challenges herself to embrace obstacles — from data collection to publication — that push her work to the frontier of her field of study. When Melwani first entered the workforce after finishing her biomedical engineering undergraduate degree in India, she strayed far from her field. Although in sales engineering, she began working closely with human resources in her company, motivated to help people improve their work days. This drive to support others led her to the United States, where she enrolled in the industrial and labor relations graduate program at Cornell University. But before starting her doctoral studies at the University of Pennsylvania, she wanted another perspective. She returned to India to work for a human resources consulting firm to see if research really was the path for her. There, she realized the limits of office culture at the time. Unanswered questions about her own everyday uncomfortable, ambiguous work interactions galvanized her return to school and to research. While working under Sigal Barsade, a researcher at the forefront of the field of emotions, she continued to bring the study of emotions into organizational behavior. After graduation, Melwani interviewed at UNC. She knew immediately it was the place she was meant to go. By studying the interpersonal effects of discrete emotions such as contempt, compassion, and anger in a series of different work contexts, Melwani’s research provides a richer picture of how emotions influence attributions, relationships, and performance of both those expressing emotions and perceiving them. Entering her seventh year at UNC, Melwani’s research lies at the intersection of people’s emotions and their interpersonal relationships. “The intersection of these two things can influence an individual’s performance at work, their ability to act creatively, and their ability to go above and beyond in terms of helping and citizenship behavior,” Melwani says. Simply going into work exposes people to a variety of events, relationships, and organizational cultures, all of which can evoke conflicting reactions and tension — something called ambivalent emotions. While people usually equate ambivalence to confusion, it can translate into something more positive: open-mindedness. An ambivalent relationship with a co-worker, or “frenemy,” typically improves job performance, according to one of Melwani’s studies . Ambivalence in leadership has a similar effect. When employees sense that a leader feels uncertain about an issue, it encourages them to share new ideas, potentially leading to better decision-making. While ambivalence can have positive impacts, it’s almost always negatively characterized and thus discouraged, making the constant balancing act between relationships, jobs, money-making, and community impact even harder, according to Melwani. Society’s preference for consistency over fluctuating emotions, she adds, can make the occurrence of ambivalence tension-filled. Melwani typically uses multiple methods in her studies including lab and field components. But before she designs an experiment, she starts with literature review and informal interviews with people who may share the experience she’s investigating. “That’s really for me to understand that my perspective isn’t just my perspective,” Melwani says. It confirms that her topic is a universal human experience. She then uses a psychology or behavioral lab to isolate and distinguish that experience. In a recent study, she set up an open-plan office — a growing office space trend — in the lab to analyze the process of “catching” other people’s emotions, or emotional contagion. In her lab, an actor received a short phone call that was either a happy conversation, an argument, or one that lacked emotion. Those exposed to the happy conversation left the lab feeling more positive and evaluated the proposal they worked on as more creative and high-quality. After hearing the argument, people left feeling more negative and rated the proposal likewise. She found similar results in an experiment that used a recording of someone on the phone walking down the hallway outside the lab. Once she finishes the lab component, she’ll replicate and build upon her findings in a real-world field study with full-time employees. Sometimes, though, it’s hard to recruit organizations to participate. But Melwani finds those challenges inspirational. That creativity, though, can present roadblocks. In her study on how people evaluate creativity, she found that while participants explicitly said they wanted out-of-the-box, novel ideas and projects, they showed a preference for more practical ideas than creative ones. She doesn’t let this implicit bias stop her, though. “I try to think about constructs that have never been explored and really try to understand them and develop a scientific method to study them,” Melwani says. 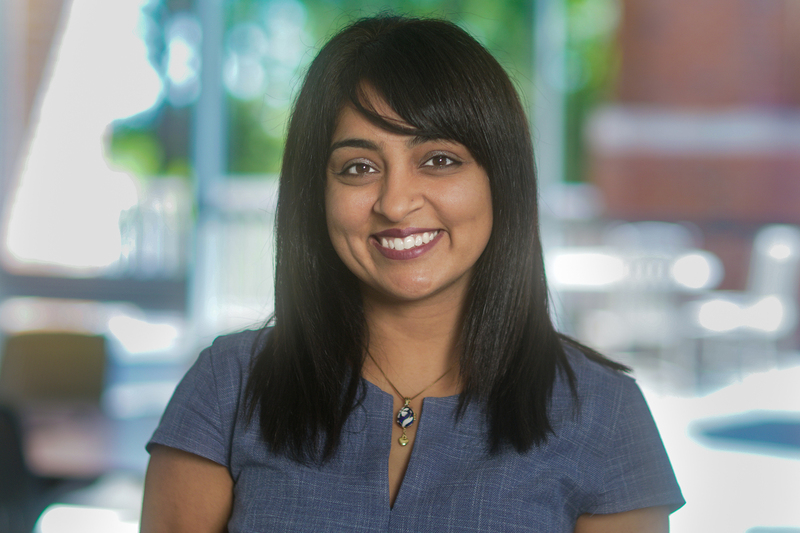 Melwani hopes her work will make office climates and leaders more compassionate and help expand the traditional definition of professionalism beyond emotionless employees and superficial work relationships. Bringing your whole self means being open at the office, which includes open discussion on how major world events — like the 2016 election — impact your job, Melwani says. There’s been extensive research on the effect of personal events, such as layoffs, but less has been done on what Melwani calls societal-level “mega-events.” With Angelica Leigh, she’s currently exploring the concept with a case study on black identity and police shootings of African Americans. These events can cause employees to shut down and withdraw, so understanding how organizations can help them cope and encourage honest conversation is critical, according to Melwani. On an individual level, she hopes people realize the importance of acknowledging and managing both their own emotions and those of others, no matter if they’re positive or negative. Through her research, Melwani shows these emotions have a function and purpose, signaling that they’re normal to feel and, even if confusing or painful, can be channeled to improve self-compassion and interactions with others. Melwani brings what she learns from her research into the classroom as well. She teaches three undergraduate courses in leadership and management every year, focusing on experiential learning and the latest research to inspire both her students and her own research. One student is Joe Nail, who co-founded Lead for America, an organization that matches recent graduates with local government jobs. After teaching Nail three years ago at UNC, she’s joined his team as director of people and culture. Shimul Melwani is an assisstant professor of organizational behavior in the UNC Kenan-Flagler Business School. Angelica Leigh is a PhD student concentrating on organizational behavior in the UNC Kenan-Flagler Business School. She assists in research with Shimul Melwani. Special thanks to the Carolina Digital Repository for making the research articles linked within this piece accessible to the public. Within University Libraries, the CDR provides long-term access and safekeeping for scholarly works, datasets, research materials, records, and audiovisual materials produced by the UNC community. To learn more about their work, visit cdr.lib.unc.edu. This entry was posted in Invention, Society. Bookmark the permalink.